Unique Provence Luxury and Authentic Travel Blog: Grasse - The Jasmine Harvest - A Unique Provence Exclusivity. Grasse - The Jasmine Harvest - A Unique Provence Exclusivity. 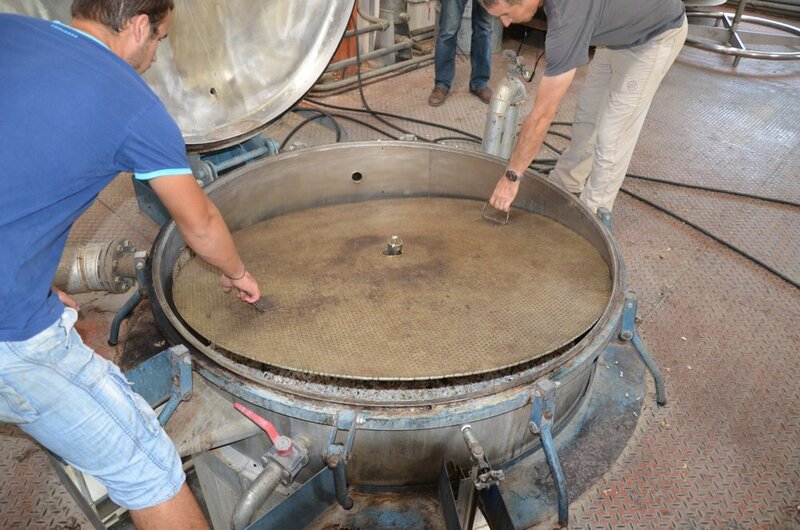 In the Middle Ages Grasse was famed for its tanneries. The leather that was produced was greatly sought after by the finest manufacturers of leather garments, and notably glove makers. The aristocracy was very fond of the fine texture of the leather that the tanners of Grasse produced, but they were less enamoured with the smell due to the use of horse urine, dog and even human excrement which was used to soften the hides. 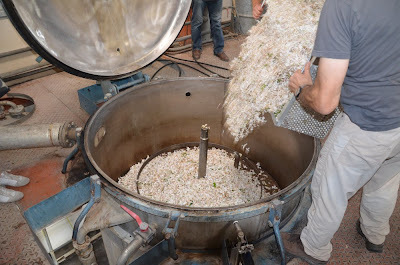 One of the biggest tanners of Grasse, the Maison Gallimard came up with a solution to this problem which involved soaking the finished product in scented baths of rose water and spices according to an Oriental technique, the result was perfumed gloves and the idea was adopted by all. A pair was offered to Catherine de Medicis who was enchanted and the popularity of the scented glove took the court by storm resulting in Grasse becoming recognised as the perfume capital of the world with different scented gloves with enticing and exotic names being created each year. However an increase in taxes on leather slowed the tanning industry of Grasse to a halt, but the perfume industry remained with tanners quickly trading in their skills and the rest, as they say, is history! 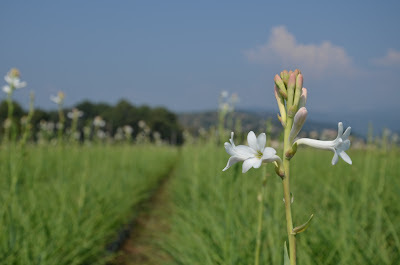 If you go to Grasse today you will be assailed by billboards enticing you into perfume houses to discover the history, and even create your own perfume along with the ten coach loads of visitors with whom you will share your tour. These visits are interesting and informative, especially if you are on a tight tour schedule. But I am not, and neither are the clients that I create tours for. Thanks to some fortunate connections, I had the privilege to be invited to visit the Gardens of the Maison Mul on the outskirts of the town of Pégomas. I was told before coming that the access to these gardens is impossible for anyone outside the perfume world, which I took to be a slight exaggeration until I arrived in front of the solid iron gate which effectively only opened to the few. And today I was one of them. The gardens of the Maison Mul extend over 40 acres, and are home to vast beds of roses (Rosa damascene and Rosa centifolia for the botanists reading this), a lesser bed of Tuber Roses (Polianthes tuberosa) which are not at all related to to the rose family, but to the Agaves (tequila!) although they bear no resemblance to a cactus like plant. 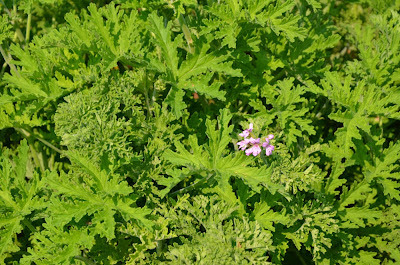 There was also a bed of Rose Geraniums (Pelargonium graveolens) whose scent emanates from the microscopic hairs on the leaves and stems and in this case bore a Citrus odour, although depending on the varieties and hybrids nutmeg, rose and even coconut can be obtained. But even as we admired and sniffed at all of these delights (except the roses, as they flower in May) the air was thick with a sweet perfume, one that had already encountered my nose before we even arrived at the gardens, and a short distance away the culprit was discovered. Jasmine blossom. 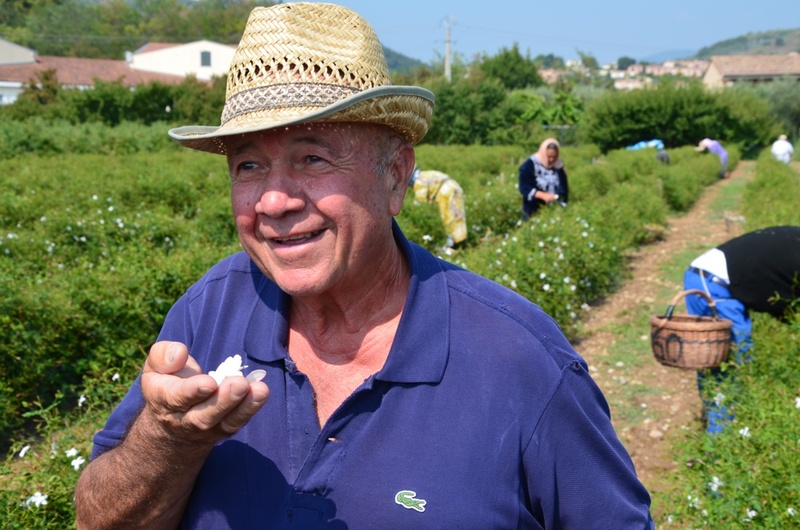 In the 1930s thousands of tonnes of Jasmine were grown in Grasse, but today that number has fallen to around 20 due to cheaper alternatives arriving from overseas. But to the “noses” of the perfume world the Jasmine produced in Grasse is like no other. 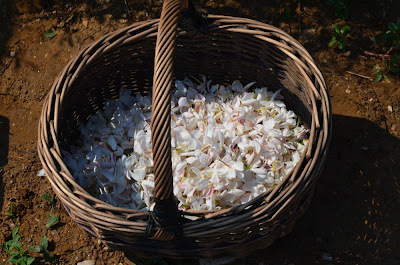 The variety used is Jasminum Grandiflorum whose origins can be found in Asia which is grafted onto the rootstock of Jasminum Officinale also of Asian origin but introduced to Europe in the 16th century and is more resistant than its host. Unfortunately to describe it is difficult, because apart from seeing the flowers, touching the flowers, watching the deft skill of the pickers and listening to the explanations of our delightful host, Mr Mul himself, the tableau is not complete without the most important ingredient, that of the heady scent of the blossoms that filled the air to a point of being nearly (but not completely) overpowering. So go and get a bottle of your favourite fragrance with strong notes of Jasmine, spray it in the air and read on. 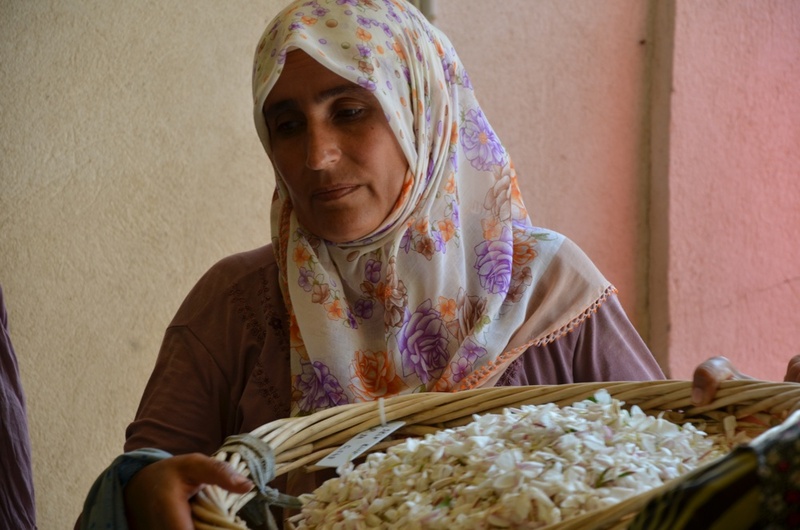 The flowering of Jasmine starts in August and continues well into October. The Jasmine plant is referred to locally as a reverse barometer because the state of the plant will tell you what the weather was like two days before, for instance if there are few blossoms today, then the temperature had dropped two days ago. Every winter the plants are pruned right back to the limit of the grafts and are then covered by “hilling” them with soil to protect them from frost. They are uncovered in the Spring and allowed to grow out before being bunched together to form the neat rows that we see in the garden. 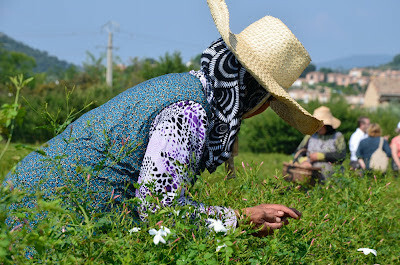 Arriving at the rows of Jasmine plants reminded me of being in a tea plantation, the pickers armed with their wicker baskets wore scarves allowing only their faces to be visible and sported hats ranging from straw panamas to extravagant tall pointed ones. Some have a small stool to sit on as they harvest the precious blossom with speed and skill, ensuring the petals are undamaged and move up the rows like a slow swarm of flower eating locusts leaving nothing in their wake. Every evening new flowers open for the pickers to pick the next day, this remarkable proliferation of blossoms is due to the fact that when a blossom is picked the plant splits and two more grow in its place, this will continue until the climatic conditions decline at the approach of winter. Once the plants have been stripped of their pungent treasure, it’s off to the weighing room. They make a run to be first in the queue, as standing around waiting in the sun after toiling under it all morning is no fun. Each basket of flowers is weighed, and the picker is given a receipt for their day’s harvest. 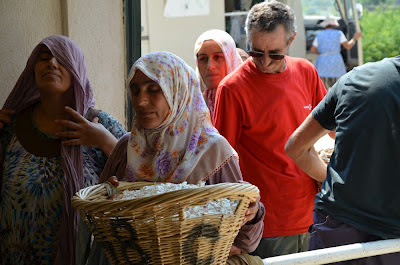 The weighing takes place under the watchful eye of Mr Mul, who knows all the pickers by name, as they come back year after year. 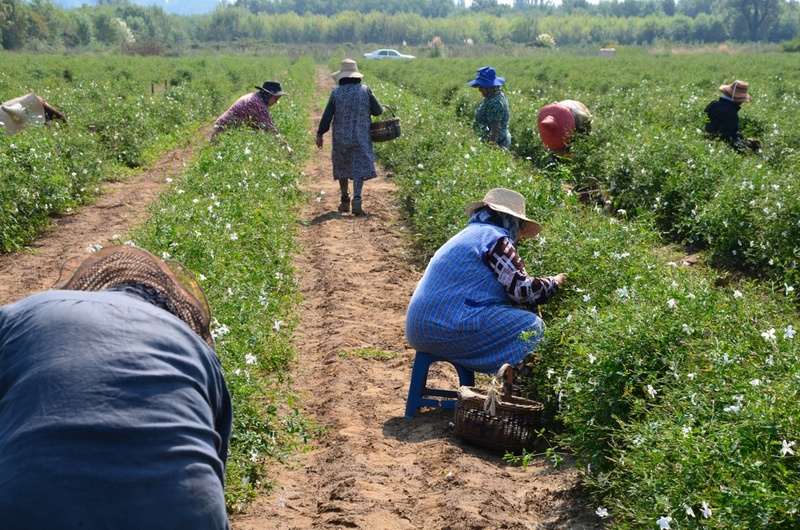 After the weighing the flowers are taken away for the extraction process which takes place on the property. They are loaded into vats, in several layers separated by metal grilles so they do not get crushed, they are then covered with a solvent which is pumped around them and the oil in the flowers is harnessed by it. 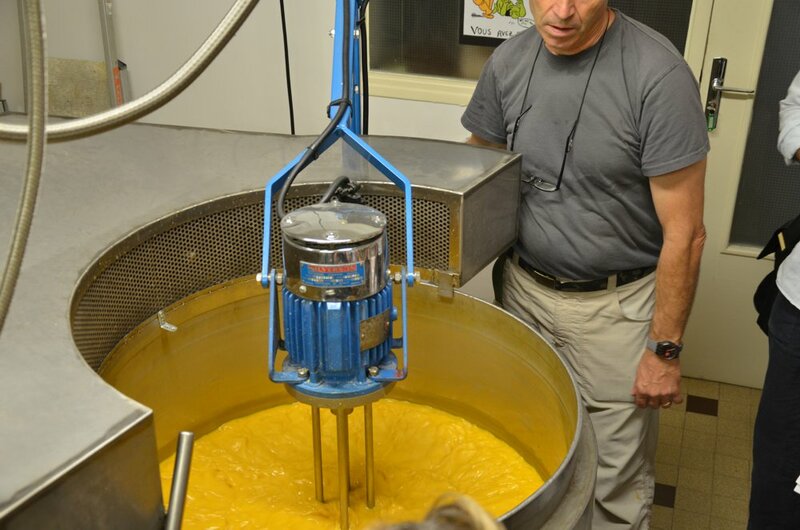 Three separate baths of solvent are given to the flowers to extract all the oil. The solvent is then distilled in a vacuum which lowers the temperature of the boiling point to 40°C thus un-harming the fragile scent molecules. 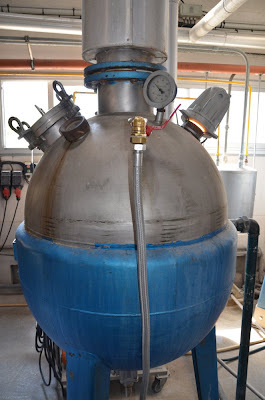 Once the solvent has been removed by the distillation an oily mixture made up of oils and waxes which solidifies when cold is left, called the Concrete. The Concrete can be stored safely until it is needed, without losing its properties. When an order for Jasmine Absolute (the name given to the final product) comes in, the Concrete is mixed with an Alcohol based solvent which harnesses the scent molecules, then it is frozen to -15°C which hardens the wax but not the alcohol, before being filtered through a very fine mesh, and the solvent containing the oil passes through leaving the wax behind. Then the alcohol is evaporated off leaving the Absolute which is the Essential Oil of Jasmine. One last detail. 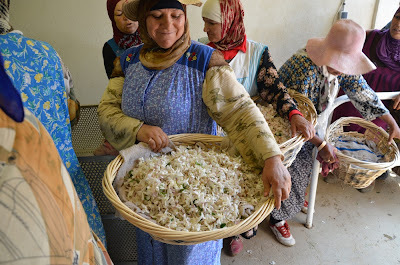 It takes 350Kg of flowers to produce 1 kilo of Concrete and it takes 2 Kg of concrete to produce 1Kg of Absolute and a single picker harvests about 2Kg a day based on what we saw, so with those figures in mind you can now begin to understand why perfume is not cheap! If you would like to visit an authentic flower garden around Grasse, then contact Unique Provence here. However, the visits are very difficult to plan and only a few are accorded each year, but no other travel agency is offering such an exclusive experience! 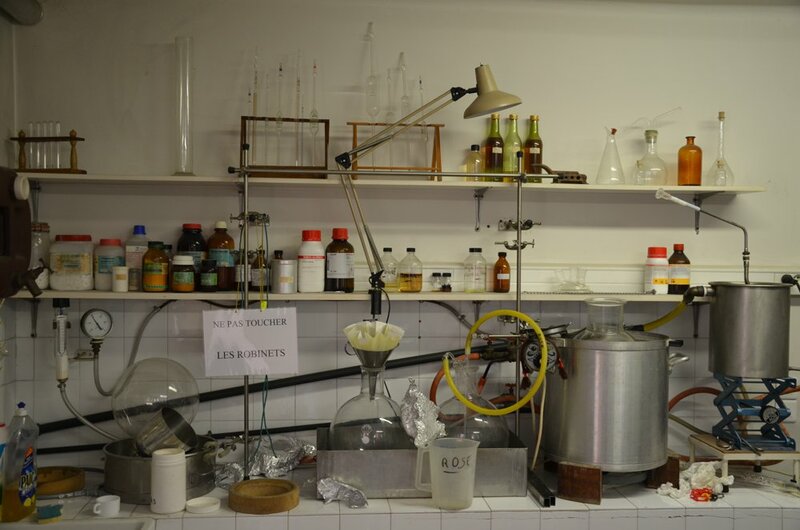 My thanks to Alain Ferro of the Grasse Institute of Perfumery, without whom this unique experience would not have been possible. Oh wow, had no idea about the jasmine harvest, loved the article and the gorgeous photos! Thank you Tuula, It's very difficult to convey the experience in writing, but I felt like I was in another world!